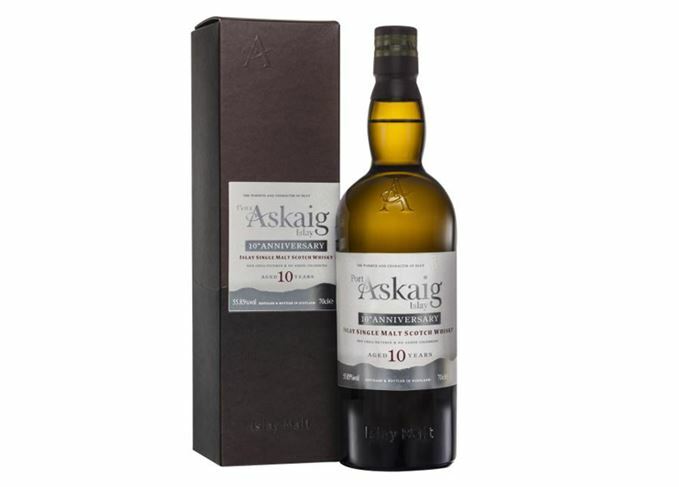 Islay single malt brand Port Askaig is releasing a limited edition 10-year-old whisky as part of its 10th anniversary celebrations. As with the rest of the Port Askaig range, the 10-year-old whisky has been sourced from an unidentified Islay distillery situated ‘close to the village of Port Askaig’, from which the brand takes its name. Botttled at 55.85% abv – the geographical latitude of Port Askaig village – the whisky is described as having aromas of burnt matchsticks, streaky bacon, pancakes and heather honey, with notes of salt-crusted rye bread, apples and samphire on the palate. The single malt was distilled in 2008 and matured in a combination of ex-Bourbon casks and ex-Sherry butts. Oliver Chilton, whisky maker for Port Askaig owner Elixir Distillers, said: ‘The liquid used for Port Askaig 10 Year Old is made up of 15% ex-solera Sherry butts, 25% first-fill ex-Bourbon barrels and 60% refill American oak hogsheads. ‘The 10 Year Old is a culmination of working with Islay whisky for more than 10 years, where we have looked at ways of balancing spirit character and wood to create elegant whisky that work as an introduction to Islay – as well as drams that you want to go back to time and time again. Just 10,000 bottles have been produced for sale in select global markets, priced at around £69.95 each. Chilton added that attitudes to peated whisky had changed greatly since Port Askaig was launched 10 years ago. ‘In 2009, Islay single malt was still a relatively small category and a much smaller part of the overall volume of Scotch whisky sold,’ he said. ‘Though the whiskies from Islay have always been highly rated by whisky enthusiasts, it was often viewed as a style that very few customers could become accustomed to and learn to love. The edition will launch in the UK and Europe from April, and be available in the US, Canada, Taiwan and elsewhere from June. The brand is also launching two further limited editions this month – a 25-year-old launched exclusively in the US, and a 28-year-old which will be available in Asia and Europe only. Port Askaig 25 Year Old has been bottled from a batch of casks sourced from an undisclosed distillery, at 45.8% abv. Limited to just 3,000 bottles, it is described as having notes of under-ripe banana, pastrami, olive oil and dried orange peel. Port Askaig 28 Year Old is a single malt created from a parcel of casks with unknown provenance, but which were selected for their ‘flavour and full-bodied texture’. With notes of fresh mint, pine resin and tea leaves on the nose, and coconut butter orange peel and pancetta on the palate, the whisky is also bottled at 45.8% abv. Just 3,000 bottles have been produced exclusively for the UK and Europe, and will be released this month at around £295 each.